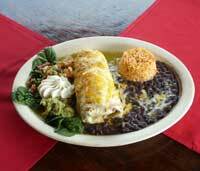 ENCHILADAS POBLANAS Shrimp enchiladas topped with dark mole sauce and sesame seeds served with sour cream. CAMARONES CINCO DE MAYO Jumbo shrimp sautéed with bacon, poblano peppers, tomatoes, onions, and smothered with cheese. QUESADILLA DE MI BARRIO Spinach tortilla shell stuffed with cheese, chicken, bacon, spinach and tomatoes served with sour cream. CHIMICHANGA TAPATIA Fried spinach tortilla stuffed with chicken, strips of beef, sautéed peppers, onions and spinach, rice, avocado, tomatoes smothered with cheese and a mild avocado and a hot arbol sauce served with sour cream. CAMARONES A LA DIABLA Jumbo shrimp sautéed in olive oil, garlic, and a hot red pepper sauce. CAMARONES AL MOJO DE AJO Jumbo shrimp sautéed on garlic, butter, and white wine sauce. CAMARONES A LA VERACRUZANA Jumbo shrimp sautéed with onions, peppers, tomatoes, cilantro and capers, finished in a white wine sauce. MACARRON Grilled chicken over penne pasta with your choice of tomato basil or pesto cream sauce. JUANITO’S BURRITO LOCO A flour tortilla stuffed with chicken, strips of beef, spinach, lettuce, tomato, avocado, black beans and jalapeños, smothered with cheese and the sauce of your choice, served with sour cream. CHILE RELLENO (Lunch 1, Dinner 2) Poblano pepper(s) stuffed with cheese, dipped in egg batter, fried, and topped with ranchero sauce. POLLO BORRACHO Grilled chicken breast topped with a mild tequila, garlic butter, and lime sauce. Served with grilled vegetable and rice. JUANITO’S VEGETARIAN Spinach flour tortilla stuffed with grilled peppers, onions, spinach, tomato, broccoli, zucchini, squash, carrots, cauliflower, avocado, and black beans. 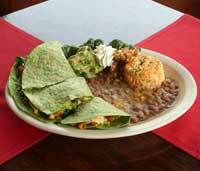 Smothered with cheese and mild green avocado sauce, served with sour cream. TACO CAMPESINO Spinach flour tortilla stuffed with chicken, portabella mushroom, zucchini, tomato, asparagus and avocado, topped with a medium creamy chipotle sauce. Mini Burrito- Chicken, ground beef or strips of beef. 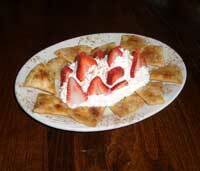 SOPAPILLAS Fried slices of flour tortilla topped with honey, butter, sugar and cinnamon.